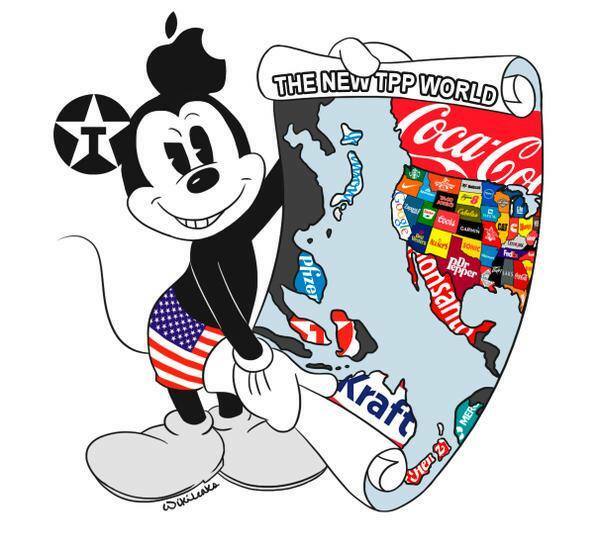 Wikileaks tries to explain TPP through graphics. (if the video doesn’t play, you can always just follow the link to Youtube. If you haven’t been following the discussion over the Trans Pacific Partnership, you might not know that the last few weeks have been bad. Lost in all our news about firearms and mass shootings and popes talking to crazy people was the news that the Trans Pacific Partnership (TPP) passed the first round of approval in the 12 represented countries and is now off to be negotiated over the next few months. In the US, it passed the fast-track (no discussion of the bill) in the dead of night last summer. The details will not be discussed in public–when the treaty is ready, it will be subject to an up-or-down vote in the House and Senate. The fact that 535 legislators gave away their right to insert changes should tell you something about the juggernaut bill that has been turned loose on the electorate. People have been calling the bill “NAFTA ON STEROIDS“, likening it to the bill passed by the Clinton White House for ‘trade’ with Mexico and Canada. Remember that for many Americans, NAFTA (aka the North American Free Trade Agreement) has been a disaster. Factories have been moved from the US to Mexico, hundreds of thousands of high-paying manufacturing jobs have been lost, and environmental and legal protections have been weakened. NAFTA’s provisions on obligating countries to follow the lowest common denominator on laws has meant that consumer products that were legal in Mexico are by definition legal for sale in the US. And NAFTA’s cousin GATT has also weakened the power of labor groups and progressive organizations to control trade with countries engaged in slave labor practices. The passage of GATT has also had an effect on local governments. In 1996, the Commonwealth of Massachusetts instituted a boycott of products from Burma (now Myanmar) due to its repressive practices and its imprisonment of Aun Sang Suu Kyi. That boycott was overturned in US court (with GATT as a factor), with SCOTUS siding unanimously with companies seeking to change Massachusetts’ law. There’s no reason to think that the Supreme Court would be any more friendly to the idea of corporate boycotts now. Please remember that the Anti-Apartheid boycott movement made a real difference in South Africa; under the rules of GATT, that couldn’t happen again. Corporations will have final say in many subjects formerly reserved for decision by elected representatives. That sounds bad. But the TPP is worse than GATT. The reason it’s worse is simple- In all issues that will be discussed before the trade organization, corporations trump the will of the people in the countries affected. Corporate power will matter more than the ballot box. This has been coming for awhile now, of course. Citizens United was a warm-up for this. And Citizens United told Americans (in no uncertain terms) that money is far more important than the will of the people, at least as far as the Judiciary is concerned. I’m not going to give you my opinions why the TPP needs to be stopped. Plenty of other people do it better. Democracy NOW! put a human face on what the TPP will mean to people with cancer. Worth your time. Wikileaks has been leaking information about the worst excesses of the agreement. They’ve put together this helpful video about the agreement. Back in August, they put together this video, seeking hard copies of the final agreement. And Wikileaks’ efforts paid off–this AM, some friends in NZ had digested a document dump and were ready to talk on the radio about the features of this agreement (New Zealand is part of the agreement should it pass). In the meantime, activists in the US have publicized the TPP’s intellectual property rights info. The next few months are crucial. On the Democrats’ side, Bernie Sanders has ALWAYS been against TPP, while Hillary Clinton fought for it until very recently. Sanders is now in the debates for the Democratic Presidential nomination, so avoiding the topic won’t be possible for Clinton (or Joe Biden, should he decide to jump in). The GOP candidates haven’t talked about it at all. Jill Stein of the Green party has always been against TPP. But by the time November 2016 rolls around, the fight will be over. Action is needed now. Start signing petitions and carrying signs now.